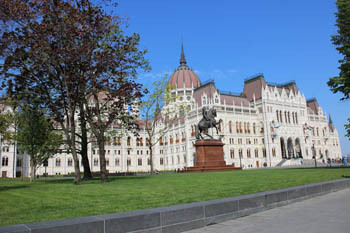 Visit the Parliament building on a 1-hour guided tour in English then go on a boat tour with buffet lunch strating at 14.00! Places for the Parliament visit are limited, so please make your booking as early as possible! Prices: vary depending on which package you choose. Please note that there is a different price of the Parliament tour for adults and students coming from the European Union and for those visiting from countries outside the EU. Cruise Meeting Point: Danube Palace, Zrínyi utca 5. Budapest 1051 (close to the Basilica). Meeting time: 13.30. 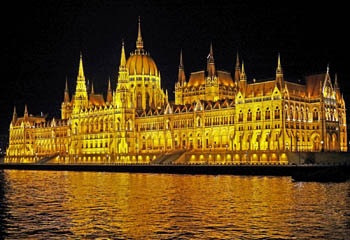 See Budapest’s top landmark, the Parliament on a 1-hour English-language guided tour. 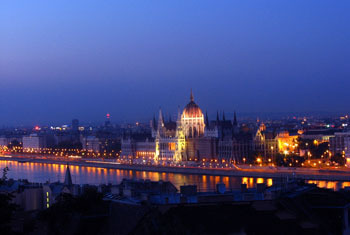 This way you can have a worthy program in Budapest covering sightseeing, culture and gastronomy. A professional guide will take you around inside the Parliament telling you all about the history and interesting facts, stories related to Hungary’s grandest building. The tour departs from the Visitor Centre located at the north side of the Parliament. The building boasts 28 staircases and you will ascend to the prestigious main floor through the richly decorated Staircase No. XVII. It is lined with statues of historic Hungarian figures and the stained glass windows offer a stunning view of the landscaped Kossuth Square. Then you visit the Upper House assembly hall that used to house the Upper House but today is home to conferences and meetings. The spacious, several galleries-high room has excellent acoustics. The seats form a horseshoe shape. the imposing oak podium for the speakers. Behind the podium you can see the pained coat of arms of Hungary’s royal families. The floor is covered with Europe’s largest hand-knotted carpet. After the Upper House Hall you will enter the adjoining Lobby. The sculptures – that are a tribute to historic Hungarian ethnic groups and long-forgotten crafts – are made of pyrogranite an innovation of the Zsolnay works. The Dome Hall is the geometric centre of the building. 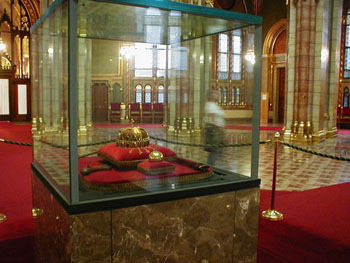 The Holy Crown of Hungary and the Coronation Insignia have been on display here under strict guarding of the Crown Guard since 01. January 2000. Don’t forget to look up the impressive vaulted ceiling divided into 16 sections and boasting colourful stained glass windows. 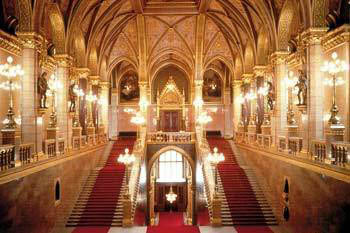 The tour ends with visiting the other focal point of the Parliament, the red-carpeted Grand Stairway. The 96 steps lead from the main entrance up to the Dome Hall. The 8 four-ton granite columns are unique in size and only 12 such are available in the world. 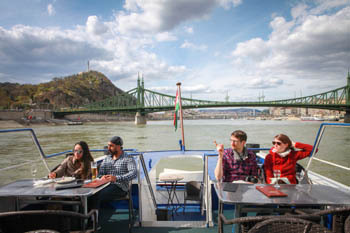 You can combine the Parliament tour with a 1,5 hour Danube lunch cruise of 4-courses served buffet style (lunch is optional, you can choose the program with cruise only). Alternatively, you can also go on an evening cruise with dinner and drinks if you prefer to admire the lit-up city after sunset. the Gróf Széchenyi Museum Ship (opening hours: 10.00 – 13.30) – both ships are anchored right next to the cruise departure-ending point! 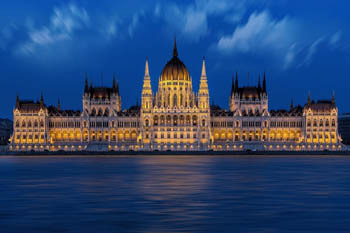 TIP: The tour of the Parliament can also be combined with a 90-minute folk music and dance show held in a downtown theatre hall, the Danube Palace. 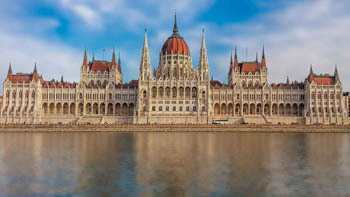 TIP: After visiting the Parliament you can learn more about its construction and the history of Hungarian legislation in the adjoining Parliament museum (it is not included in the tour price but the exhibitions are free to view). TIP: Explore the Lajta War Ship museum anchored on the Danube next to the Parliament. It’s the oldest operating naval monitor ship in the world and you can learn about its history through audio guiding. Excellent program for families with children! Following booking you will receive a booking confirmation in e-mail. This will be your ticket to the Parliament, make sure to bring a PRINTED COPY of it with you. You may enter the Parliament building following a security check. Larger bags, packages and objects capable of causing injury are strictly prohibited. The Parliament may cancel the tour due to programs and state protocol events. A ticket cannot be refunded or rescheduled. Visitors may not remain inside the Parliament following your guided visit due to security reasons. The price of the program includes the Parliament booking fee as well. Student prices are valid for students under 24 years of age. Make sure to bring your student ID.